This bike has been well cared for and has had all service done by the dealership. The bike is in excellent condition. It also comes with an extra seat and a cover. Hello, I'm interested in your 2003 Heritage Softail® Classic Anniversary. 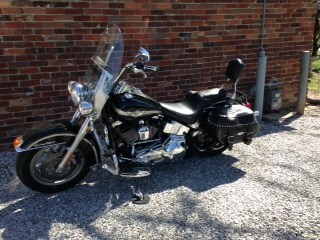 Hello, I'm interested in making an offer on your 2003 Heritage Softail® Classic Anniversary. Hello, I'm interested in trading in my bike for your 2003 Heritage Softail® Classic Anniversary. Hello, I'm interested in taking your 2003 Heritage Softail® Classic Anniversary for a test ride.